I’m a huge fan of flip flops. 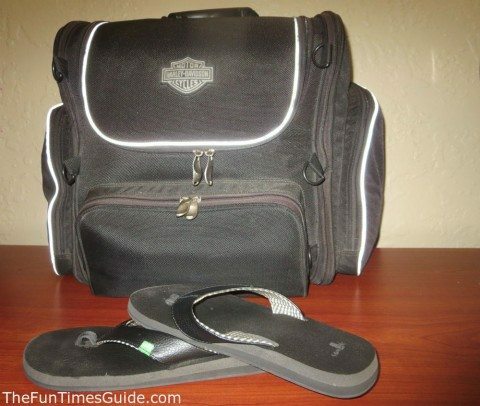 These days, they make flip flops in so many different styles that you can wear them practically anywhere! They can be casual and comfy, beachy, and fun. Or they can be semi-dressy, wedge-style, with bling. As a result, I have several pairs of flip flops. My favorite pair for the past couple of years has been this pair of Sanuk yoga mat flip flops that I got from REI. They’re also available on Amazon, which is probably where I’ll buy my next pair from. Sanuk: A Fun And Unique Company! For starters, Sanuk means FUN in Thai. My website is The FUN Times Guide. And since my whole life is based on doing things and writing about things that are FUN…. a pair of Sanuk sandals were destined to be mine! Sanuk is definitely a unique company that’s about having fun and not taking themselves so seriously. Extremely comfortable – especially when you’re on your feet for long hours. For example, I wore them on my first Segway tour where your feet and toes really get a workout! I was surprised how cushy my feet felt, while others were complaining of having tired feet. In fact, I’ve seen lots of people with fibromyalgia recommending Sanuk yoga mat flip flops — because they help to alleviate the chronic foot pain. Small and compact… great for travel – since they’re relatively thin (yet cushy!) and they’ve got a really low-profile, they’re my casual shoe of choice when traveling. I especially like ’em when we’re on long-distance motorcycle rides — where luggage space is quite limited. And since they’re so lightweight, there’s practically no added weight from traveling with these shoes on-board. 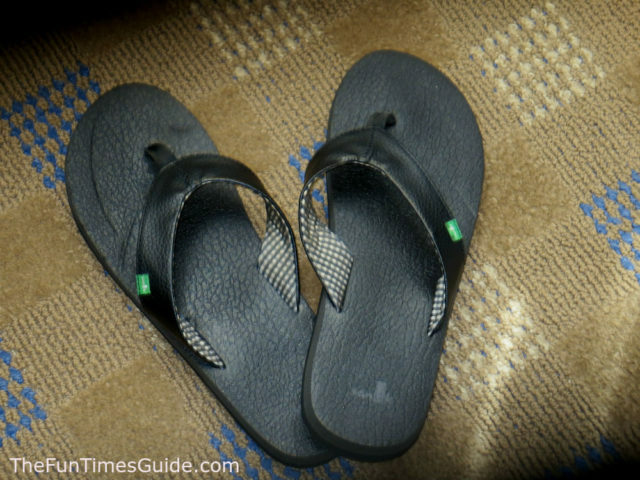 Yoga mat cushioning bounces back to its original shape – when I bought my Sanuk yoga mat sandals, I figured they would become flat and show the impression of my foot after wearing them a lot. But they always bounce right back and there’s no impression left behind of my foot or toes — even after 2 years of wearing them regularly. They truly are like walking on clouds! Can get wet – I like when a pair of shoes can serve double duty when traveling. These work as my casual run-around shoe, as well as shower sandals when we’re camping (or taking showers in less-than-ideal “budget” hotels). Padded straps – some shoes have a break-in period. These do not. Thanks to the lightly padded straps and toe strap, I’ve never experienced rubbing or blisters while wearing these Sanuk sandals. Decent no-slip traction – I’ve never feared losing my footing or a lack of traction when wearing my Sanuk sandals. There’s a slightly textured footbed on the inside, and the hardened EVA outsoles provide lightweight traction on the outside. Lots of fun colors – when trying a new brand of flip flops for the first time, I always start with solid black color — since it goes with everything. Then, if I like ’em, I’ll buy in more fun colors after that. I just recently purchased 2 additional colors of the Sanuk yoga mat sandals. Environmentally friendly – constructed from recycled yoga mats, these eco-friendly flip flops are also vegan and made for those who care about the planet. Seriously long lasting – mine are just over 2 years old, but here’s a review after 9 years of frequent wear. Must read: Are Your Shoes Healthy For Your Joints & Health? No arch support – this is typical with most flip flops, but I really wish these yoga mat shoes had some built-in arch support. I have very flat feet and will take any minuscule amount of support I can get. Little protection from sharp, pointy objects underfoot – I learned this firsthand when I was trimming the thorny branches of a tree on our yard. I ended up stepping on one of the thorns, and it pierced right through the sole of the shoe and into my foot. Water-friendly, but not water-proof – while you can get them wet and even wear them in the water, since the yoga mat footbed doesn’t have sealed edges, these flip flops tend to hold onto water (like a sponge). They also take a long time to thoroughly dry out. I’m told, if you don’t dry them out completely, they’ll start to smell (like a dirty dish sponge). I’ve never experienced this myself since I always make sure to dry them out right away. More expensive than other flip flops – but then again, these aren’t your typical throwaway flip flops. No way! They’ll definitely last you several years, and that alone is worth a little more — especially when combined with how incredibly comfortable these sandals are. Psst… if you want a cheaper pair of yoga mat flip flops, try making your own.